230 Cumberland Avenue - Asheville Home of the Week! She has lived in this quaint Victorian house just outside downtown Asheville for the past 2 1/2 decades, working to ensure its longevity. 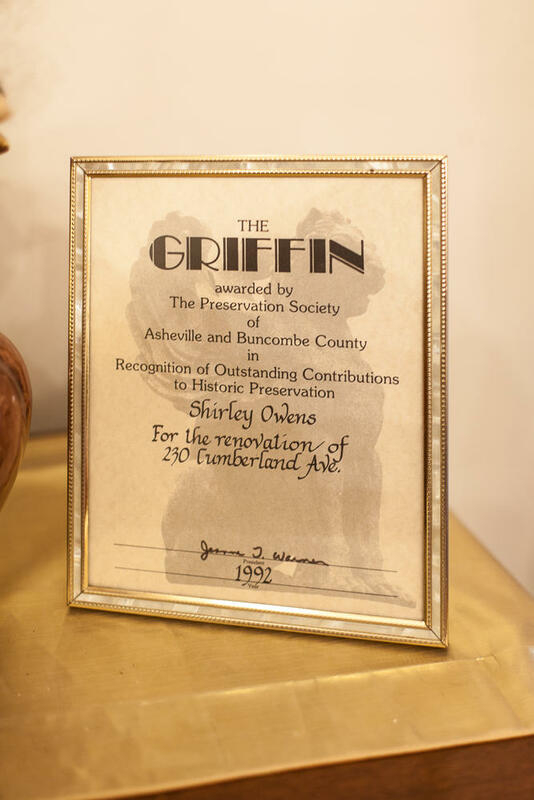 And although that is only a moment in the history of the more than century-old landmark, Shirley Owens has left her mark, having spent years returning what once was a tumbledown palace to its original grandeur. "I know every scratch on the floors," she said. These days, the three-story house is a gem in the Montford historic district, exuding an Old World Charm. 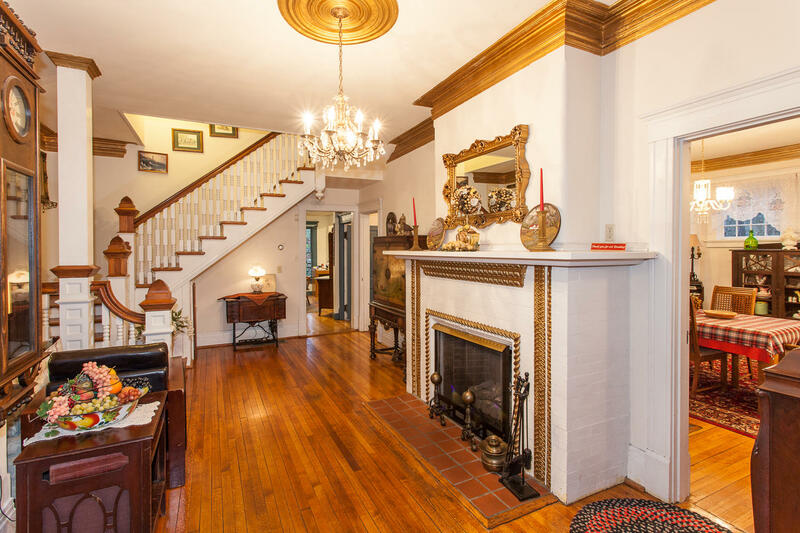 Throughout are antique furniture, original hardwood floors and windows with wavy glass panes, and seven fireplaces that once burned coal or wood. Family heirlooms and pictures abound. 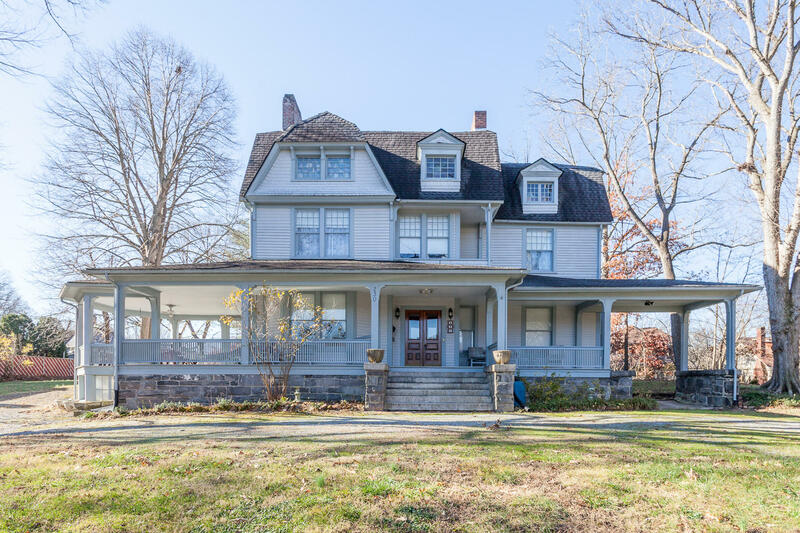 Sitting atop its original rock foundation, on a nearly one-acre property across Cumberland Avenue from the Holy Trinity Greek Orthodox Church, the house contains 6,000 square feet, including eight bedrooms and four baths. Outside, a broad wooden porch wraps around a light-blue facade, with a gazebo-like sitting area at one end and a porte-cochere at the other. Just beyond the front door, next to the high-ceilinged foyer, is a light-filled dining room featuring a crystal chandelier and a fireplace with a hand-carved brick mantle, along with a brass weather vane in one corner. In the kitchen, next to a tiny butler's pantry with a pass-through serving window, metal bars partially cover the windows, a vestige of the turn of the last century, when they were needed to guard against looting. On the second and third floors are quaint bedrooms with transom windows, one of them including a high-poster bed more than a century old. Outside one is a tiny widow's walk. One of the more remarkable features of the house is that it has two staircases, a grand one and an enclosed one once used by the butler. The house has remained in Shirley's family for more than six decades. It was built by a Scottish railroad tycoon in 1890, around the same time as Biltmore House, according to family records. For a time, it served as a boarding house before being repossessed during the Great Depression. Decades later, in the 1950s, it was bought by Shirley's father, a World War II veteran who worked in the advertising industry. It wasn't until the late 1980s that Shirley came to live here, to care for her father after he had fallen ill. He died soon thereafter, leaving in her hands a house that had all but fallen into ruin. "It was on its way down," Shirley said. But it has since undergone a revival, albeit a gradual one. Overgrowth was cleared, its electrical and plumbing systems reconfigured and its shingle roof replaced, among many other things. "I knew she'd be grand again one day," Shirley said with a smile. In her early 70s, Shirley has spent much of her time here alone, save visits from family and friends. Preparing to retire from a supervisory role at a credit union in Asheville, she plans to move into a house she used to rent out in Morganton, where she grew up and near where one of her two grown sons live. As for the Grand Old Lady, it is for sale, for about $1.2 million. Shirley put it on the market a couple of months ago, after spending about a year deciding whether to do so, citing financial reasons. For more information on the sale of this beautiful home contact the listing agents: Amy Giles & Eva Hartman.